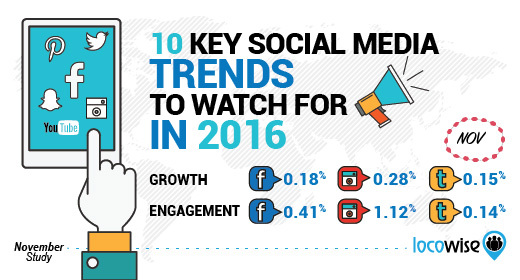 Social analytic and reporting firm Locowise released its Facebook and Instagram data for November, along with 10 predictions for 2016. Facebook organic growth,reach and engagement were all at the lowest levels since Locowise began studying them seven months ago. Engagement on Instagram is down 60 percent since April. Instagram saw follower growth of 0.28 percent in November, followed by Facebook at 0.18 percent and Twitter at 0.15 percent. The average Facebook post reach was 7.15 percent of all page likes—8.94 percent forvideos, 8.36 percent for links, 6.7 percent for photos and 5.23 percent for status updates. The average Facebook post engaged 5.77 percent of users reached—6.11 percent for video, 6.05 percent for photos, 4.04 percent for status updates and 3.82 percent for links. 42.01 percent of Facebook pages studied used advertising on the social network to purchase 28.98 percent of their total reach. Instagram’s engagement rate was 1.12 percent of its total audience—far stronger than 0.41 percent for Facebook and 0.14 percent for Twitter. The decline of all-things-organic to continue. Increasing importance of getting others to share your content. Instant Articles and the decline of traffic to websites. Messengers are eating the traditional social media world.